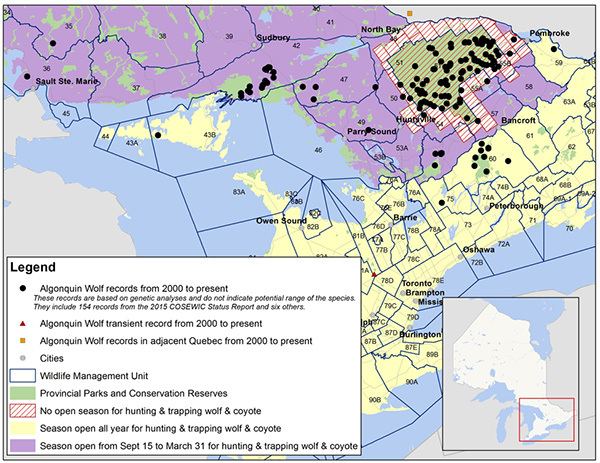 Using non-invasive samples collected during the Eastern Wolf Survey, as well as archival blood samples from previous research, the scientists elucidate the distribution of eastern (AKA Algonquin) wolves in Ontario, adding known occurrences of this rare species in areas of Killarney Park and Queen Elizabeth II Wildlands. These occurrences were used by the scientific committee in Ontario (see Figure from provincial assessment). 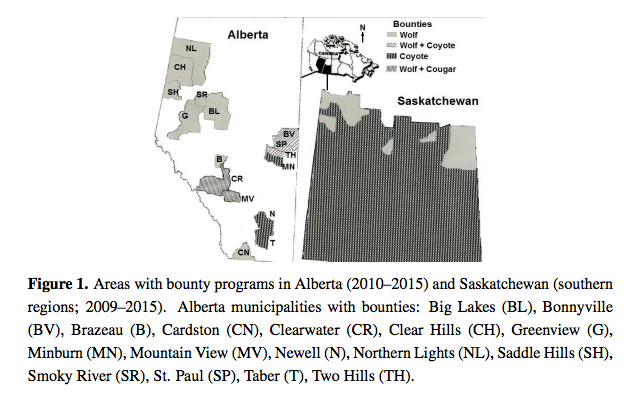 Although predation bounty programs (rewards offered for capturing or killing an animal) ended more than 40 years ago in Canada, they were reintroduced in Alberta in 2007 by hunting, trapping, and farming organizations, municipalities and counties, and in 2009 in Saskatchewan, by municipal and provincial governments and the Saskatchewan Cattlemen’s Association. Bounty hunters use inhumane and non-selective killing methods such as shooting animals in non-vital regions, and killing neck snares and strychnine poisoning, which cause suffering and delayed deaths. They are unselective, and kill many non-target species, some of them at risk. Predator bounty programs have been found to be ineffective by wildlife professionals, and they use killing methods that cause needless suffering and jeopardize wildlife conservation programs. Our analysis therefore indicates that government agencies should not permit the implementation of bounty programs. Accordingly, they must develop conservation programs that will minimize wildlife-human conflicts, prevent the unnecessary and inhumane killing of animals, and ensure the persistence of all wildlife species. Read the full, open-access article here. This commentary was written by biologists in British Columbia, Alberta and Saskatchewan in response to unethical and disturbing research being conducted in Alberta: the killing of more than 1000 wolves ostensibly to protect woodland caribou in an area of Alberta almost completely disturbed by oil and gas development. The government of Alberta sanctioned the wolf killing by means of aerial gunning, strychnine poisoning and strangulation by snare. In unpublished documents obtained by Raincoast Conservation Foundation, the Alberta government outlined the accidental death by strangulation in snares of 676 other animals, including caribou that the wolf snaring was ultimately being used to protect. Figure 1. 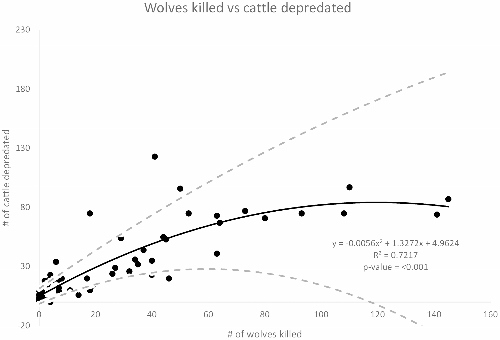 Wolves killed vs cattle depredated. Number of wolves killed through control methods the previous year versus the number of cattle depredated the following year. The dashed lines show the upper and lower limits of the 95% confidence interval for the best fit line. Researchers out of Washington State University used 25 years of data on wolf control measures from Montana, Wyoming and Idaho to study the effects of killing wolves on the probability of livestock depredation the following year. They found that killing wolves increases the chances of cow and sheep depredation significantly. More than 25% of the wolf population must be killed in order to reduce the odds that livestock will be killed the following year, and the authors point out that this level of wolf killing is unsustainable. To explain their results, the researchers refer to literature that discusses wolf behaviour. For example, killing some wolves from a pack disrupts the social order of the pack, possibly leading to more breeding pairs, loss of cultural knowledge and wild prey killing techniques, and wolf population growth following larger litters the following season. All of these scenarios can exacerbate wolves’ use of livestock as prey. The researchers suggest that livestock producers hoping to decrease depredation should practice non-lethal predator management. Read the open-access, peer-reviewed article published in PLoS ONE here. The research was published in the peer-reviewed journal Animal Conservation. Figure 1. 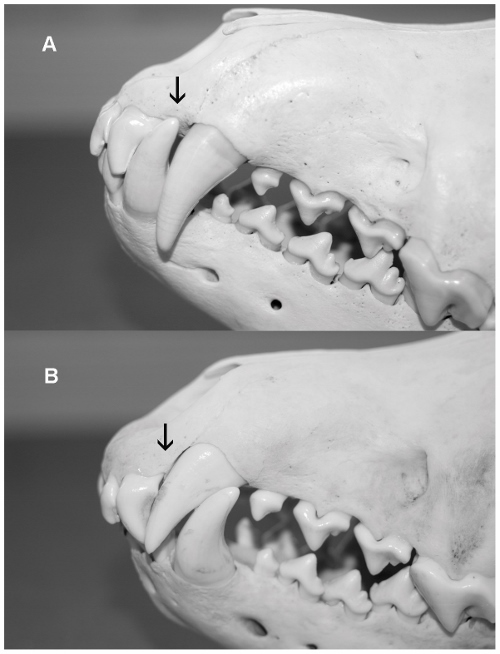 Normal canine occlusion in comparison with malocclusion of wolf NRM 20095298. The normal mandibular canine fits in the diastema between the maxillary third incisor and the maxillary canine, see arrow in panel (a). The malocclusion shows a mesioverted canine (tooth 204). Because of the anomaly the normal diastema is absent, see arrow in panel (b). This precludes normal mandibular canine occlusion that resulted in overshot jaw and palatal trauma from the right mandibular canine (tooth 404). The trauma led to periodontal damage of the right third maxillary incisor (tooth 103). Photos by J. Räikkönen. Following many years of unrelenting persecution, wolves were virtually extinct in Scandinavia in the 1960s. Following protected for wolves in Norwary and Sweden, a pair of Finnish-Russian wolves recolonized southern Scandinavia and served as founders for the current population size of about 300 individuals. Researchers analyzed anomalies in physiology and genetics from wolves born between 1978 and 2010 and discovered that the anomalies increased significantly over this 32-year period. They point out that these anomalies are likely a byproduct of inbreeding, and suggest that conservation plans need to prioritize genetic health of wildlife in addition to basic goals such as population size. Social tolerance of wolves is low in this part of the world, and this reflects heavily on the relaxed conservation goal set for the wolf population to be maintained at approximately 200 animals via wolf hunting and trapping. The study emphasizes the degree to which politics can affect wildlife conservation, and reasons that ” in some cases, population health cannot be achieved in what is determined to be a socially-just manner or without infringing upon the vital or non-vital interests of some humans. Such cases do not, however, warrant the relaxation of conservation goals. Instead they warrant conceding the inability to achieve conservation, or conceding that population health is less important than the human interest with which it is in conflict. Such a dilemma represents a failure and a tragedy. It would be wrong to hide the failure by lowering the standards for conservation.” Ultimately, the researchers suggest that genetic rescue in the form of human-assisted wolf migration into Scandinavia would be necessary to improve the health of the Scandinavian wolf population. Read the peer-reviewed article in the open-access PLoS ONE journal here. Researchers from western Canada compared stress hormones in hair samples taken from two populations of wolves: one from the tundra-taiga that is heavily hunted, and one from the northern boreal forests that faces little to no human disturbance. “The hair samples revealed that progesterone was higher in tundra–taiga wolves, possibly reflecting increased reproductive effort and social disruption in response to human-related mortality. Tundra–taiga wolves also had higher testosterone and cortisol levels, which may reflect social instability”. See the peer-reviewed article from Functional Ecology here. Read an article written by Dr. Marc Bekoff about this research in Psychology Today here. Wolf researcher Dr. John Vucetich from Michigan Technological University and Dr. Michael Nelson of Oregon State University discuss the ethics of predator control and wolf hunting in general. Using argument analysis, the researchers dissect popular reasoning for the killing of predators, notably the wolf. They concluded that there are no adequate reasons for killing predators for pelts, trophy or in fear of livestock depredation and competition with popular game species. “To kill a sentient creature for the purpose of using its body or part of it as a trophy is essentially killing for fun or as a celebration of violence. And, although there was once a time when trapping wolves for their pelts might have been a respectable means of making a living because wolf pelts were then a reasonable way to make warm clothing, we no longer live in that time”. You can read the article written as a chapter for the Oxford Handbook of Animal Studies here. 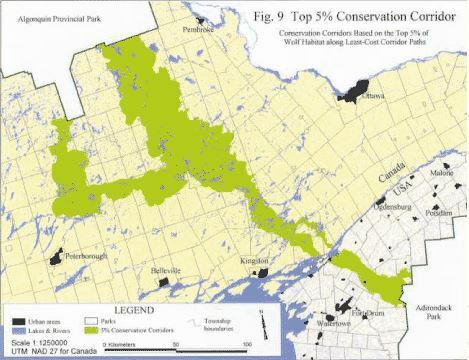 In a report prepared for the The Greater Laurentian Wildlands Project, researchers evaluated demographic, biological, and geographical features between Algonquin Provincial Park in Ontario and the Adirondack Park in New York to identify areas of high conservation value. The landscape was assessed with respect to eastern wolf movement south from Algonquin into New York state’s protected Adirondack area. Focussing on wolf habitat conservation indirectly protects a number of other species’ habitat as well, since wolves are umbrella species that use high quality, undisturbed habitat types that host a number of other native species. The study identified a corridor that would facilitate wolf and other wildlife travel, and suggests that these areas be conserved for this purpose. These results highlight the need for intergovernmental conservation policies to support natural wolf recolonization throughout its former range, thought likely to extend to the northeastern states, including New York state. You can read the full report here courtesy of Ancient Forest Exploration and Research.